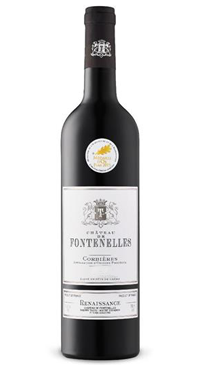 Chateau de Fontenelles, in the Languedoc Rousillon, has been a family run domaine for five generations. The estate now stretches over 40 hectares and is planted to Syrah, Grenache Noir, Carignan and Mourvèdre on the outskirts of Alaric, in the Corbières AOP and the Aude Côteaux Miramont PGI zone. The estate is committed to sustainable viticulture and winemaking. Cuvee Renissance is a blend of 55% Syrah and 25% Grenache Noir with old vine Carignan and Mourvedre making up the other 20%. The wine was vinified in vats, some of the juice underwent partial carbonic maceration. The wine then matures 12 months in French oak. The nose is expressive, with dark brambly fruit, balsamic and subtle wood notes. Elegant mouthfeel with concentrated fruit and harmonious balance of juicy acidity and velvety tannins. This would be a treat with beef tartar, roast duck and game birds.